Captain Charlie Scavuzzo died from a massive heart attack on Friday, September 15, 2017. This was just days after Hurricane Irma’s damaging winds, storm surge and rain bands struck our area on September 10, 2017. In the days leading up to his death, Captain Scavuzzo worked around the clock ensuring the community and agency were prepared to endure and recover from the storm. In addition, just prior to the storm's impact, Captain Scavuzzo led a team of detectives in a homicide investigation, adding to the stress and demands of an already chaotic environment. Charlie was immensely dedicated to his family and career. Throughout his 24 years with the agency and 28 total years in law enforcement, he served in uniformed patrol, street crimes, criminal investigations, special investigations and professional standards. At his passing, he was commander of the Criminal Investigations Division, overseeing homicide investigations, crime scene, evidence handling, domestic violence cases, sexual offender cases, identity theft crimes, computer crimes, auto theft, warrants, undercover drug crimes and intelligence led policing. He is survived by his wife and three children. ​Sgt. 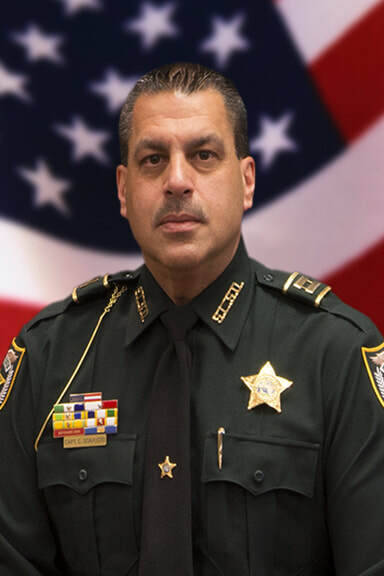 Gary Morales joined the Sheriff's Office in October 2000. His assignments included Uniform Patrol, the School Resource Unit, the SWAT Team (in which he was lead sniper), the Special Investigations Unit and the Training Unit. ​​​Firefighter Lt. Mark Morrison, 53, was a 25-year veteran of the St. Lucie County Fire district assigned to Fire Station 3, on Ravenswood Lane. Port St. Lucie. On March 4, 2012, he suffered a heart attack on duty which claimed his life. ​Firefighter Charles E. Yarborough, a 21-year veteran of the St. Lucie County Fire District, died December 9, 2008, from complications during surgery to repair a muscle tendon he tore on the job. He was assigned to Station 4 at the county airport. Among his duties was driving the Airport Firefighting Apparatus truck. ​Master Deputy Joseph S. Hover, a 24-year veteran of the Sheriff's Office, was injured during defensive tactics training and died on October 8, 2005, of complications from surgery to treat his injury. ​Master Deputy Hover was the first Sheriff's Office investigator to specialize in auto theft cases. To honor his memory, the agency's Curtis King Boulevard substation, which houses the Auto Theft Unit and other agency components was renamed the "Master Deputy Joseph S. Hover Substation." 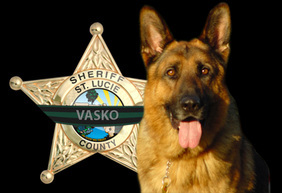 ​K-9 Vasko of the St. Lucie County Sheriff's Office died on June 25, 2004 from gunshot wounds he received while he and his partner were apprehending a kidnapping and carjacking suspect. Master Deputy Steve Roberts of the St. Lucie County Sheriff's Office was a 14-year veteran of the agency, spending many of those years riding a motorcycle for the Traffic Unit. He was a family man and an avid horseman, serving as a member of the Sheriff's Posse. ​On February 11, 1999, while en route to a traffic accident on North 25th street, Master Deputy Roberts' motorcycle was struck by another motorist, causing him to sustain critical injuries. He spent nearly a month in intensive care before succumbing to his injuries on March 3, 1999. He was 38 years old. The Sheriff's Office administrative center on Midway Road was renamed and dedicated as 'The Master Deputy Steve Roberts Building" in memory of his commitment. ​Sgt. Donald R. Mahan became the first member of the Port St. Lucie Police Department to lose his life in the line of duty. In the late evening hours on Tuesday, May 12, 1992, while responding to a disabled vehicle on U.S. Highway 1 in Port St. Lucie, Sgt. Mahan was struck by a passing motorist. He was transported to the hospital where he succumbed to his injuries a few hours later, on Wednesday, May 13, 1992. ​Sgt. Mahan had been a resident of Port St. Lucie since 1989, coming from Lake Park, Florida. He was a motorcycle officer with the Traffic Division of the Port St. Lucie Police Department and a member of the Police Benevolent Association in Port St. Lucie. On 29, 2001, the Port St. Lucie Police Department building was officially renamed "Sgt. Donald R. Mahan Building." ​Sgt. Danny Parrish of the Fort Pierce Police Department was shot and killed on January 18, 1991, while making a traffic stop on a car traveling the wrong way on a one-way street with one headlight out. ​The 18-year-old driver tried to give Officer Parrish false names. Realizing this, Sgt. Parrish began to arrest the suspect who then spun around on the officer and took his service weapon. The suspect then shot him 14 times before fleeing. He was arrested the same night with the remaining two rounds from Sergeant Parrish's gun in his front pocket. He was convicted of murder and is confined in the state prison system pending appeals. ​Capt. Grover Cooper, III, and Sgt. 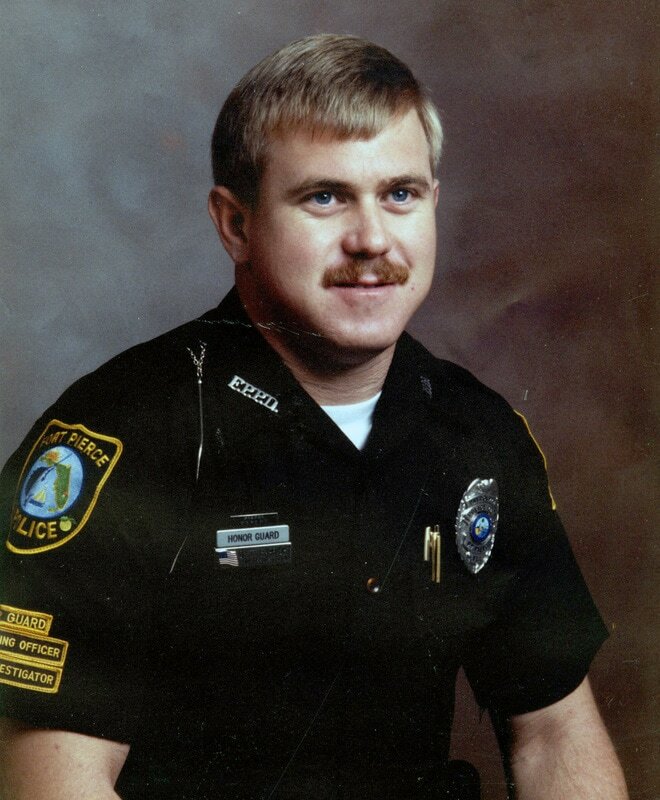 Jimmy Wouters of the Fort Pierce Police Department were shot and killed January 12, 1987, while participating in a drug raid at a mobile home in White City. A third officer, Robert Spring, was wounded in the incident, recovered and eventually retired from the department. The Fort Pierce Police Department's main station has been named in their honor. ​Sgt. 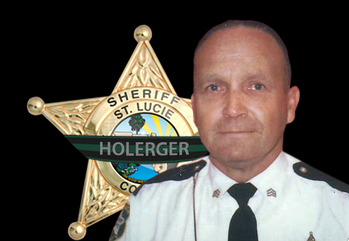 Harold F. Holerger joined the St. Lucie County Sheriff's Office in 1963. He had a distinguished career with the agency, and retired in 1981. Shortly after his retirement, he took a part-time position as a school crossing guard. On the morning of August 26, 1985, Sgt. Holerger was directing traffic on Angle Road at the entrance to Westwood High School, when he was struck and killed by a motor vehicle. ​His commitment lives on with the Sheriff's Office firearms training range that bears "Pappy" Holerger's name. ​​Sgt. Willie B. Ellis of the Fort Pierce Police Department was shot and killed after he and another officer responded to a domestic disturbance call on July 17, 1966. The male suspect opened fire on the officers, striking Sgt. Ellis five times and wounding the other officer twice. Sgt. Ellis' partner managed to return fire, seriously wounding the suspect. It was later learned the suspect had escaped from MacClenney State Mental Hospital. The suspect was convicted of Sergeant Ellis' murder and sentenced to life in prison. He died in prison in 2003. On November 4, 2000, the police substation at 1220 Avenue D was dedicated to the memory of Sgt. Ellis. ​Captain Earl Leslie Rountree, 32, of the St. Lucie County Fire District, was driving a fire truck to a Fort Pierce grass fire January 9, 1956, when a car struck the side of the truck, killing him and injuring another firefighter on the truck. Captain Rountree joined the Fire District in 1942, served with the U.S. Army in World War II, and returned to the Fire District where he was promoted to Captain. Deputy Soren A. Sorensen was a traffic officer appointed by Sheriff Daniel S. Carlton on January 7, 1913. He was known as a “careful and cautious driver,” according to a news article written at the time. ​Around 4 a.m. on March 25, 1921, about one mile north of John's Island, deputies seized a cabin cruiser loaded with 200 cases of illegal liquor. Three men were arrested, and Sheriff Monroe was called to join them at the Winter Beach dock. As the Sheriff piloted the boat down the Indian River nearing Fort Pierce, the boat exploded, killing him instantly and injuring two other deputies. The Sheriff was 42 years old, leaving a wife and four young children. ​Sheriff Carlton was involved in a shootout in the middle of the business district of Fort Pierce and was fatally wounded. Sheriff Carlton was taken to Dr. H.D. Clark's office where he later died. 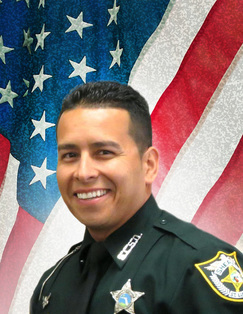 Daniel S. Carlton was the first member of the St. Lucie County Sheriff's Office to be killed in the line of duty.